This addon calculates weights for gear, based on stat weights you set (per role). Shows a tooltip displaying the weight below the normal tooltip. 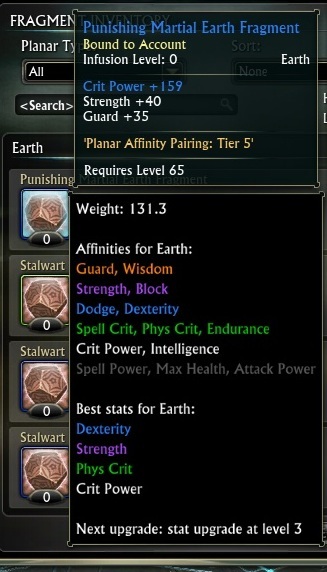 There are some additional tooltip options for planar fragments - you can display the affinities for the fragments' element, a list of the best stats for that element, and a part that lets you know what level the next secondary stat upgrade will be. The stats are colored by tier, tier 1 (best) will be relic orange, while tier 6 (worst) will be trash-loot grey. You can turn on/off all these options in the Settings tab. Here, Dexterity is the best Air fragment to get. The number in parenthesis is the Planar Affinity Tier. For Dexterity, that is Tier 4. The number in the square brackets is the relative weight - basically a measure of how close the other stats are to being best. Here, Crit Power is [0.96], which means Crit Power is very nearly as good as Dexterity (about 96% as good). This also means that if your weights change a bit in favor of Crit Power, it could then become the best stat. Attack Power is much lower at [0.56], so it is not nearly as good as Dexterity, and is unlikely to change. The addon can also recycle planar fragments. Use the Recycle tab, and check the boxes. Fragments will be recycled if they meet all the selected requirements (element, main stat, tier, level, and rarity). You can also save the rule for later use again. The addon only recycles fragments in your fragment inventory, it will not recycle any fragments in your normal bags. In the example screenshot, I recycle (almost) all fragments that have dodge as the main stat. Relic dodge fragments, or dodge fragments I leveled above 0 would not be recycled. /printfrags (or just /pf) will print out your current total stats from equipped fragments. You can also use '/pf tank' or '/pf dps' to show only tank or dps stats.